The Scooter-Safe scheme was developed in response to increased concerns about the number of accidents and fatalities involving untrained, uninsured and unsafe mobility scooter users as vehicles have become larger in size and more powerful and easily available, including 2nd hand. After several incidents on local buses, Network Warrington, now known as Warringtons Own Buses, introduced a temporary ban. Sadly there were 4 deaths in the country last year and thousands and thousands of accidents, weve had dozens in Warrington and mobility scooter users dont need a medical, a licence or a test, they dont need insurance or an MOT and the latest mobility scooters can travel at eight miles an hour and theyre deadly in the wrong hands were quotes from Dave Thompson, CEO of Warrington Disability Partnership when speaking on the topic of the dangers of mobility scooters. The Scoota-Safe events allow users to test mobility scooters available from WDPs social enterprise, The Disability Trading Company, on the free test track before they buy with guidance from the staff from Warrington Shopmobility Service, to ensure users feel confident, Its about educating people for the future said Dave Thompson, CEO of Warrington Disability Partnership. 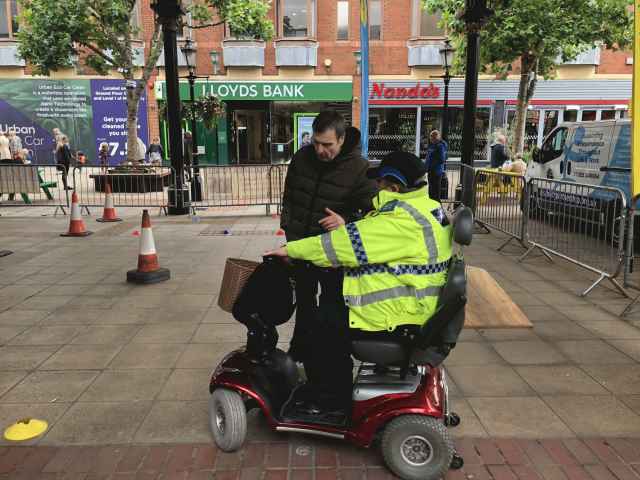 Warrington Disability Partnership led the development of Scoota-Safe initiative with support from Network Warrington, Warrington Borough Council Highways Department and Cheshires Police and Crime Commissioner David Kean. Together we looked into what could be done to raise awareness of the safety aspect of owning and using mobility scooters. Free training is available to help people to understand which scooters could go on buses and educating the public on safety when using mobility scooters and electric wheelchairs in shopping areas, and on pavements, parks and open spaces. As well as the Scoota-safe scheme the event show cased the latest mobility products available at The Disability Trading Company, The Mobility Workshop and Service Centre located at the Centre for Independent Living. Also on offer were free pre-winter safety checks and local vehicle adaption specialists BAS (NW) displayed the latest vehicle adaptions including hoists, seating and hand controls. Warrington Disability Partnership hopes these Scoota-Safe events will raise awareness on scooter safety, giving users information, advice and guidance on the range of products, plus proper training to prevent accidents and making travel accessible and safe for everyone.